Atmospheric with pop-focused sensibilities, drawing on the influence of post-punk bands like The Cure, The Smiths, and Joy Division, with a style derivative of the indie, alternative aesthetic of bands like Metric and Arcade Fire. 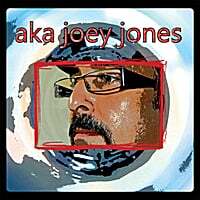 "aka joey jones" is the eponymous first release of an ongoing recording project by Canadian songwriter, Joe Cappadocia. Cappadocia, who is also the guitarist in the Hamilton, Ontario alternative rock band, Mass Conception, conceived of the aka joey jones project while recording the band's third CD, "The Greatest Show Never Seen." "Recording the album was inspiring," he writes, "an exhilarating experience crafting our music and bringing new dimensions to it." Through this process, Cappadocia realised he had to produce and finish the many songs he had written and recorded in his basement studio. "I've amassed quite a number of songs," he recently commented, "songs I keep coming back to and working on but that I've never finished. I am now compelled to finish them." These songs will form the foundation of aka joey jones.